← No Comment Moderation Here! On Monday night a few baseball fans will be watching (or, like me, listening to) the Cuba vs. Japan finale in the World Baseball Classic. Only two major leaguers will play in the game – both for Japan. The MLB star-studded teams of the USA, Dominican Republic, and Venezuela have all been eliminated. I, for one, am cheering for Cuba. They have a great style of play, and you have to like a team that performs so well despite their substandard training facilities and amateur status. I’m no fan of Fidel Castro, but I’m less a fan of the unjust embargo the United States has against Cuba. I’m hoping that the guys in red win this whole thing and get a chance to thumb their nose at US foreign policy tomorrow night as they lift the trophy above their heads on American soil. (Then, I hope the whole team jumps the railings and runs into the stands, defecting to the United States to spite the unjust Castro regime – imagine the theater!). One more thing. Read this great artcile from Yahoo! 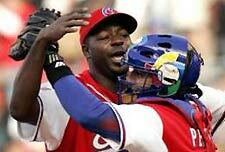 Sports about Pedro Luis Lazo, the great pitcher for Cuba. At the end of the article commentator Jeff Passan describes a brief meeting between Lazo, who had just mowed down the Dominican lineup, and Albert Pujols, the Dominican superstar who is an all-star for the St Louis Cardinals. Pujols didn’t recognize Lazo at first, but at second glance and after a few pleasantries, he offered a powerful plea: "Represent the Caribbean." No embargo, no dictatorship, no dominating pitching performance could get in the way of Pujols wishing the best for his fellow caribeno. Though I’m sure Bud Selig would have preferred to see the Dominican team in the final, this is the kind of comraderie and story that the World Baseball Classic was designed to create. And in this regard, it was a success. Do we really have to wait four more years for the next Classic?